Although the phenomenon of state failure is not new, it has become much more relevant and worrying than ever before. In less interconnected eras, state weakness could be isolated and kept distant. Failure had fewer implications for peace and security. Now, within a more interconnected global community these fragile states pose dangers not only to themselves and their neighbors but also to peoples around the globe. Preventing states from failing, and resuscitating those that do fail, are thus strategic and global imperatives. CIC has provided research in this arena, developed panel dicussions that have explored critical issues confronting failed states. CIC has also drawn on expertise from the practitioner, NGO, academic and UN communities, provided candid recommendations and potential solutions to the global threat that failed states present. o Burundi was placed on the Peacebuilding Commission’s (PBC) agenda in June 2006, as the peacekeeping mission there was drawing down. This report assesses the PBC’s in-country performance against its different mandated functions and tools of engagement. 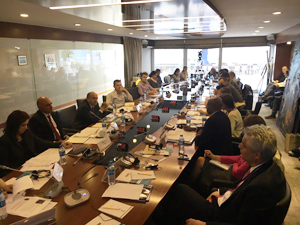 It also considers the potential for the PBC’s engagement through the Country-Specific Meetings and assesses implications for the concept of Country-Specific Configurations. o The ability to monitor and report on performance is increasingly important for any successful sector. Individuals, organisations or systems cannot improve unless their shortcomings are identiﬁed and practical and creative solutions for improvements are put forward. This report aims to provide a system-level mapping and assessment of international humanitarian assistance. o The nature of risks to global security has changed dramatically since the fall of the Berlin Wall, but our mechanisms for preventing, responding and adapting to them have lagged far behind. While there have been limited efforts to develop more effective international responses, these have been piecemeal and have produced only modest increases in global resilience. This report serves as a think piece to stimulate discussion about possible solutions. As the displacement of Syrians and other refugees in Turkey becomes increasingly protracted with no quick solution to the conflict in Syria in sight, overstretching the resources and capacities for the refugee response to its limits, formulating strategies and solutions to address the medium to long-term needs of refugees and host communities becomes increasingly vital.